Paintings by artists Walter Edmonds and Richard Watson at the the Church of the Advocate. This year’s Black History Month is nearing its end, but that’s no reason to stop celebrating. Many of Philly’s historical markers honor influential African Americans and their achievements 365 days a year. From Underground Railroad stops to the house where Paul Robeson spent his final years, we’ve curated a list of markers in six parts of the city that shed light on some of the notable artists, activists, musicians, and more. Each stop includes suggestions for further exploration nearby. Location: 2908 W. Diamond St.
About: The first black painter to gain international notoriety, Henry Ossawa Tanner moved from Pittsburgh to Philadelphia in his childhood. At 21, while he was living in this Strawberry Mansion home, he enrolled at the Pennsylvania Academy of the Fine Arts — the second African American to do so — and studied under Thomas Eakins. He moved to Paris in 1891 to continue his education and eventually became known for his landscapes and religious work, including Daniel in the Lions’ Den. His depiction of the The Resurrection of Lazarus so impressed Rodman Wanamaker that the Philadelphia merchant financed some of Tanner’s trips to the Middle East. Nearby: About a 20-minute walk south in Brewerytown, find the Monkey & the Elephant (2831 W. Girard Ave.), a nonprofit coffee shop employing former foster youth. Or grab a beer at Crime & Punishment Brewing Co. (2711 W Girard Ave.), where pierogies and cheese boards pair with creative brews. Henry Ossawa Tanner in 1917. Location: 1511 N. 33rd St.
About: Perhaps the most influential saxophonist in jazz history, John Coltrane made his way to Philadelphia from North Carolina in 1943. He was based out of this Strawberry Mansion home from 1952 until 1958, playing gigs in North Philly clubs (sometimes performing on top of the bar). His frequent stints with big-time big bands, including those of Dizzy Gillespie and Miles Davis, eventually took him to New York City. Nearby: A 10-minute walk away, the Smith Memorial Playground and Playhouse (3500 Reservoir Drive) is a kid’s paradise, with a 16,000-square-foot indoor playhouse and sprawling outdoor park with swings, climbing structures, and a 39-foot-long, 13-foot-wide slide (sadly closed January through March). Swing by Charlie’s Country Ribs (2528 Diamond St.) for lunch. The Smith Memorial Playground & Playhouse in Fairmount Park is less than 10 minutes from the John Coltrane historical marker at 1511 N. 33rd St . Location: 18th and Diamond Streets. About: Built from 1887 to 1897, this Gothic Revival masterpiece became an anchor for North Philadelphia’s African American community starting in the 1950s. It was a center of activism during the civil rights movement, hosting national Black Power and Black Panther gatherings in the 1960s and ’70s. It was also where the first female Episcopal priests were ordained, in 1974. 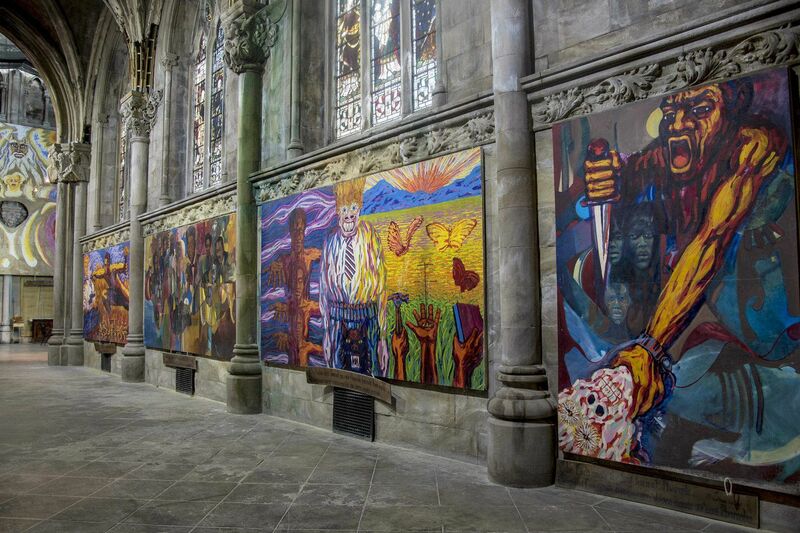 The Episcopal church offers tours that discuss its architecture, social history, and its series of murals documenting the “stations” of the civil rights movement. Nearby: Catch a movie at the AMC Broadstreet 7 (1600 N. Broad St.), by Temple’s campus. The theater boasts cushy recliner seats and a bar. Location: Corinthian and Girard Avenues. About: Situated six blocks west of Broad, Girard College opened in 1848 as a school for “poor, white male orphans.” After World War I, the neighborhood around the 43-acre campus became predominantly African American. The school maintained its exclusive policy despite several challenges — even after Brown v. Board of Education ruled that racially segregated public schools were illegal. In 1965, the Philadelphia NAACP chapter led a protest campaign attended by the Rev. Dr. Martin Luther King Jr. outside the school. It wasn’t until 1968, after City Council member and attorney Cecil B. Moore took the issue to federal court, that the school admitted students of all races. Nearby: Walk four blocks south on Corinthian Avenue and you’ll hit Eastern State Penitentiary, which held some of America’s most notorious criminals, including Al “Scarface” Capone and “Slick Willie” Sutton. When you’re finished exploring, grab lunch or a drink at one Fairmount Avenue’s many restaurants. Demonstrators march around the walls of Girard College after a rally at the main gate by NAACP. Location: 244 S. 12th St.
About: Known as the father of the Underground Railroad, William Still moved to Philadelphia from Burlington County in 1844 and found work as a clerk for the Pennsylvania Society for the Abolition of Slavery. While living in this Midtown Village home, as well as another in Bella Vista, he helped hundreds of slaves escape to freedom. He later published The Underground Railroad (1872), an 800-page tome documenting the stories of those he helped. Nearby: Philly Magic Gardens (1020 South St.) — the three-lot, bi-level epicenter of Isaiah Zagar’s distinct mosaic art — is less than half a mile away. William Still kept records of Underground Railroad activities in Philadelphia and used them for the basis of a book he published in 1872 . Location: 254 S. 12th St.
About: Born in Philadelphia, Meta V.W. Fuller was one of the leading black female sculptors of her time. She attended the Pennsylvania Museum and School for Industrial Art (a precursor of the University of the Arts) before heading to Paris, where she briefly studied under Auguste Rodin. Much of her work reflected African heritage and folk tales, including Talking to a Skull. She went on to display her work at the Pennsylvania Academy of the Fine Arts alongside such artists as John Singer Sargent and Mary Cassatt. This marker stands outside her former home near Washington Square. Nearby: Stop in at Square One Coffee Roasters (249 S. 13th St.) or Writer’s Block Rehab (1342 Cypress St.) for coffee or a cocktail. Or take in a little more history a few blocks east in Washington Square, once a burial ground for Continental Army troops. About: The Philadelphia-born, Quaker-educated son of two free African Americans, Forten served as a powder boy on a privateer ship during the Revolutionary War. Later, he made his fortune as a well-respected sailmaker, employing white and black workers. He used his wealth and status for abolitionist causes, petitioning Congress to amend the Fugitive Slave Act of 1793 and financing William Lloyd Garrison’s newspaper the Liberator. The American Anti-Slavery Society was founded in his Society Hill home here in 1833. Nearby: Play pool at Tattooed Mom (530 South St.), grab a sandwich at Famous 4th Street Delicatessen (700 S. Fourth St.), or go shopping at Philly AIDS Thrift (710 S. Fifth St.) — where proceeds are distributed to local AIDS organizations. The historical marker at 336 Lombard St., outside James Forten Sr.'s Society Hill home. This marker is at the former Bella Vista home of Octavius V. Catto, one of the city’s greatest African American activists and educators, who was recently honored in statue form at City Hall. Beyond successfully fighting for the desegregation of Philadelphia streetcars, Catto was a teacher at the Institute for Colored Youth (precursor of Cheyney University) as well as captain of the Philadelphia Pythians baseball team. A major in the Pennsylvania National Guard and a tireless advocate for black voters’ rights, he was assassinated on South Street on Election Day in 1871 at age 32. Nearby: Stroll south on Ninth Street to the Italian Market, beginning around Christian Street, for restaurants, taquerias, cheese and butcher shops, family-owned groceries, and more. Or wander west to 15th Street to see the mural honoring Catto at 1427 Catharine St., exploring South Street shops along the way. 'Remembering a Forgotten Hero,' a 2018 mural depicting Octavius Catto at 1427 Catharine Street. About: Although she was raised in Baltimore and spent much of her career in New York, legendary jazz singer Billie Holiday was born in a hospital in West Philadelphia. She came to Philadelphia more often in her later years — she died at 44 — after losing her cabaret license, the result of spending a year in prison for drug use. This marker stands in front of the old Douglass Hotel, where Holiday frequently stayed; the Showboat club in the basement was a jazz hub. Nearby: Grab a cone at Big Gay Ice Cream (1351 South St.) or some jerk chicken at the Jamaican Jerk Hut (1436 South St.). After refueling, head over to the historical marker at Tindley Temple (750 S. Broad St.) — see below. Philadelphia-born Billie Holiday will join the Philadelphia Music Walk of Fame. Location: 762 S. Broad St. Nearby: You’re blocks away from Washington Avenue’s hub of Vietnamese food. Hit up Pho 75 (1122 Washington Ave.) for a huge bowl of soup, or snag a table at Nam Phuong (1120 Washington Ave.) for pan-fried noodles and fried rice. The inside of Tindley Temple United Methodist, an historic black church that, at its peak, had 10,000 congregants in the 1920s. About: The Christian Street Y, as it’s often called, opened in 1914 — the first black YMCA to have its own building. It became an anchor of the community, providing evening classes, temporary lodging, job placements, and a social gathering spot. It also became a center for sports, particularly basketball: In 1953, 16-year-old Wilt Chamberlain led the Christian Street Y team to win the National YMCA Basketball Championship. Nearby: If it’s nighttime, consider who’s on the bill at Boot & Saddle (1131 S. Broad St), four blocks east and three blocks south. For dinner, check out Cafe Ynez (2025 Washington Ave.) or wander south to American Sardine Bar (1800 Federal St.). About: A Princeton native, star Rutgers football player, and Columbia Law School graduate, Paul Robeson spent his career as a prominent, multitalented artist. He sang classics like “Ol’ Man River,” acted in movies like Showboat and Song of Freedom, and starred in nearly 300 performances of Othello on Broadway. As he traveled the world, his activism grew, eventually drawing the attention of the House Un-American Activities Committee in 1956. Robeson moved to his sister’s Walnut Hill house in 1966 and spent the last decade of his life there. Nearby: Take a stroll in Malcolm X Park (5100 Pine St.), then head over to see the Robeson mural at 45th and Chestnut Streets. Then snag a Lebanese lunch at Manakeesh Cafe Bakery & Grill (4420 Walnut St.) or an Ethiopian spread at Abyssinia Restaurant (229 S. 45th St.). Location: 756 N. 43rd St.
About: Portrait artist Laura Wheeler Waring came to Philadelphia from Connecticut to study at the Pennsylvania Academy of the Fine Arts (and later in Paris). She is known for her insightful portraits of prominent African Americans, including W.E.B. Du Bois and Marian Anderson, some of which are housed in the prestigious National Portrait Gallery. She also taught in and headed the art department at Cheyney University until her death in 1948. She lived in this West Powelton home during her final years in Philadelphia. Nearby: Take a 15-minute stroll to the Tiberino Museum (3819 Hamilton St.), a tribute to African American artist Ellen Powell Tiberino. Call ahead (215-386-3784) to book a viewing appointment.